The Nordic Roaster 2011 competition is divided into 2 parts: The ESPRESSO competition and the FILTER competition. To win the NORDIC ROASTER 2011 title roasters must compete in both competitions. All roasters can compete, also outside the Nordic countries. 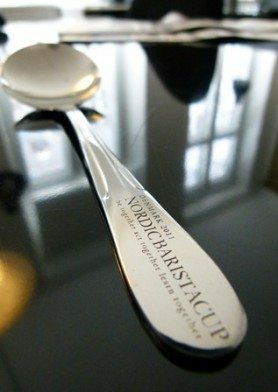 Sign up to Nordic Roaster 2011 competition by “buying” the competition fee in the NBC webshop. Each participating roastery needs to have one person present at the Nordic Barista Cup to guide and calibrate the baristas that will brew the espressos for the competition. On the competition day there will be 10 Dalla Corte espresso machines DC PRO producing 10 different espressos that will be given to each attendee simultaneously. Prior to the competition each roaster will be given time at the espresso machine in order to instruct the baristas that will brew his / her coffee to ensure a correct extraction. The water used for the espresso machines will be Copenhagen City water (hardness 18-23⁰ dH) filtered through the filter installed on the Dalla Corte machine. The espresso coffee will be tasted blind by all attendees at the 2011 Nordic Barista Cup. Each person attending the Nordic Barista Cup 2011 will have one vote. The roastery with the most votes wins the espresso competition, and the points will be added to the Filter coffee competition and count in the Nordic Roaster total score, where the roastery with the most votes in the 2 competitions will be awarded the 2011 Nordic Roaster title. The ESPRESSO coffee for the 2011 competition has to be delivered at latest 25th August 2011 at 12.00 to a BUNN representative. N.B. To be able to win the Nordic Roaster 2011 competition you must also compete in the Nordic Roaster 2011 filter competition. See below. 1. Is it espresso or filter? You can influence how many grams of coffee to be used pr. liter of water for brewing and the grind setting for the coffee. Each roastery will have the opportunity to try the brewers during the day of the 25th and 26th of August. When the roast masters have decided upon the brewing parameters of their choice, they need to label their coffee bags with the dose and grind setting of their choice and/or inform the certified BUNN brewing instructor about it. The coffee will be ground on a Mahlkönig grinder set to a standard filter grind if nothing else is instructed on the label of the coffee bag. All coffees will be brewed at the same brewing program set by the certified BUNN brewing instructor. The filter coffee will be brewed into 4 liter thermal servers using a BUNN I-C-B brewer at 92 degrees Celsius. The machine is adjusted to give a contact time of around 5 minutes. Water quality will be Copenhagen City water (hardness 18-23⁰ dH). Each person attending the Nordic Barista Cup 2011 will have one vote. The coffee with the most filter votes will win the Nordic Roaster 2011 FILTER Competition. The points will be added to the ESPRESSO competition and count in the Nordic Roaster 2011 total score. The roastery with the most votes in the 2 competitions will be awarded the 2011 Nordic Roaster title. The FILTER coffee for the 2011 competition has to be delivered at latest on 25th of August at 12.00 to a BUNN representative. N.B. To be able to win the overall Nordic Roaster 2011 competition you must also compete in Nordic Roaster 2011 espresso competition. See above.